In a food processor, process lentils and parsley until mostly smooth but some texture still remains. Transfer to a large bowl. Add egg, ricotta, 2 tblsps parmesan, 1/2 tsp minced garlic, mixed herbs and breadcrumbs. Stir well and let mix sit for at least 20 minutes. Meanwhile, make lemon pesto sauce: in the same food processor (which has been rinsed), process basil, pine nuts, 2 tblsps Parmesan, 1 tsp minced garlic, olive oil, lemon juice and zest and water until smooth. Add more water to thin if desired. Set aside. Roll tablespoons of lentil mixture into balls and place onto a baking tray lined with baking paper. Drizzle with a little extra virgin olive oil and bake at 200 degrees Celsius fan forced for 20-25 minutes or until golden brown. Meanwhile, cook pasta according to packet directions and stirfry vegetables in a large frypan over medium heat in 1 tblsps extra virgin olive oil. Once pasta is cooked, drain and toss through vegetables along with lemon pesto sauce. 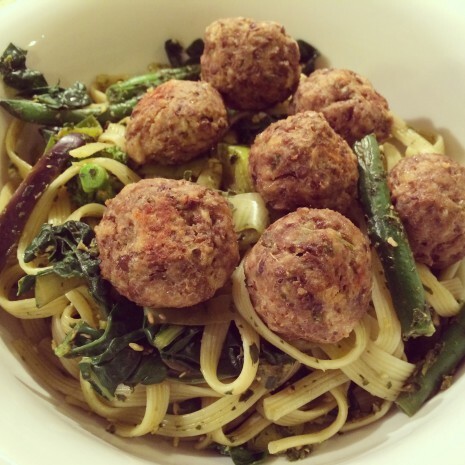 Divide vegetable pasta among 5 bowls and top with coked lentil balls. Top with extra grated Parmesan, if desired. Lentil balls and lemon pesto sauce can both be frozen once cooked.